When you are looking to convert to longitude and latitude, you could always use a little bit of help. This is where the latitude and longitude converter comes into the picture. Instead of having to pull out complicated calculations and equations out yourself, you can simply enter information into the excel template and it will get everything done for you. That is the beauty of the latitude and longitude converter, which you can download right here. There are some different ways to express latitude and longitude. They can be told in the form of decimals, degrees, minutes, and/or seconds. The notation does not matter too much, because they are all showing the same thing. However, calculating among them is difficult, which is where the latitude longitude converter comes into it. If you are ever in the situation of traveling or needing to try and find out where a specific spot is, then you can use the latitude longitude converter. This converter will allow you to figure out exactly where you need to be, and you can figure it out in the format that works best for you. If you put in the decimal figure in the latitude longitude converter, you will be able to get the degrees/minutes/seconds figure. The opposite will also work very well for this latitude and longitude converter. This is a great converter if you are a person who needs to make these calculations all of the time. The best part is that it is so simple. The latitude and longitude converter works like a charm. All you do is input the information and there is your result! 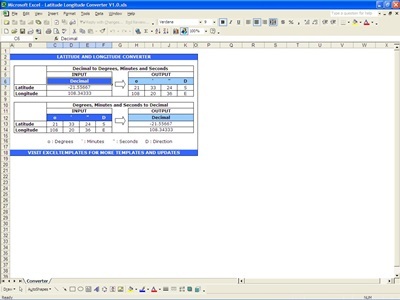 Do not bother with any other latitude longitude converter when you can use this excel template. The great thing about the excel template is that this latitude and longitude converter can get the job done so easily. So get the latitude longitude converter and see just how great it is.